Product prices and availability are accurate as of 2019-04-19 18:25:42 UTC and are subject to change. Any price and availability information displayed on http://www.amazon.com/ at the time of purchase will apply to the purchase of this product. Create creepy crawlies that are cute! 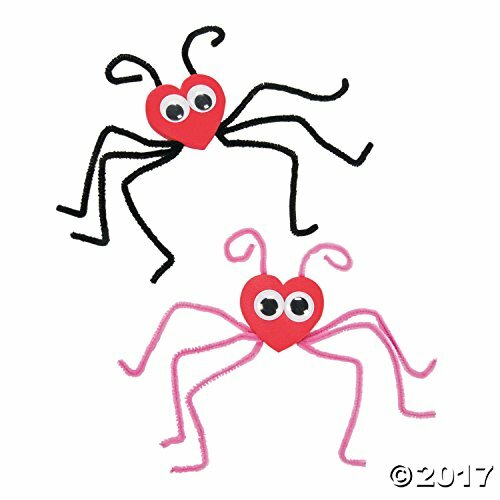 A fun addition to Valentine's Day crafts, these little critters are easy to make and add some heart to an art lesson. Each love bug has six legs, two antennae and a pair of oversized, expressive googly eyes. Once kids are done creating this loveable craft, they'll have hours of fun playing with their new love bug friend! Includes plastic googly eyes and chenille stems. Foam. 5" x 4" Makes 12. All craft kit pieces are pre-packaged for individual use. Kits include instructions. Set of 12 Adorable 3D Heart Shaped Love Bugs!! Made of Foam ~ Chenille Sticks ~ Googly Eyes Each Kit is pre-packaged for individual use. Kits include instructions ~ EASY to Make Size: 5" x 4"